1. How do I get a permit? 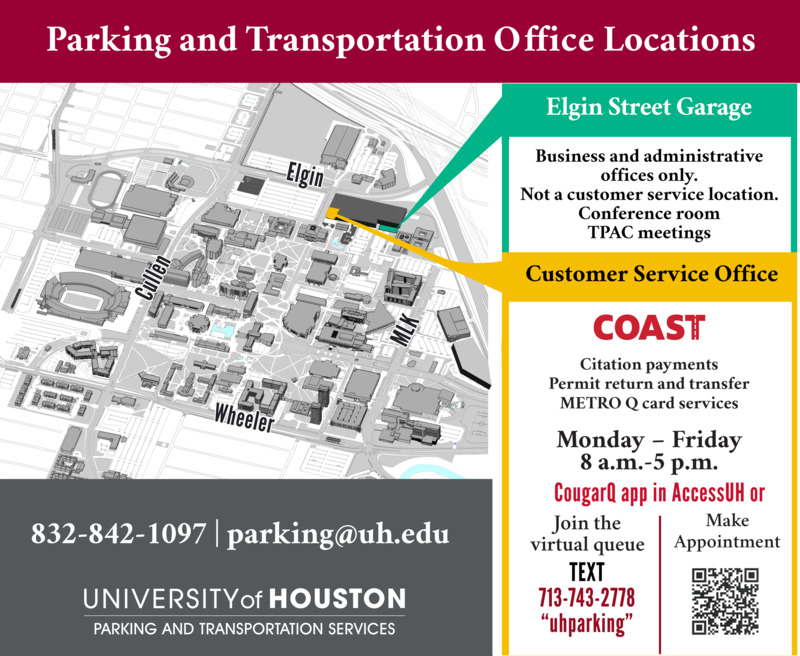 You can purchase a parking permit through your myParking Account, accessible via AccessUH. This tutorial takes you through each step of the process. All student permits will be sold online only and your permit will be mailed to the address chosen in AccessUH during the registration process. 2. I’ve ordered my permit, how will I receive it? All permits ordered online will be mailed to the mailing address chosen during the registration process. Permits ordered before a semester begins, will be mailed approximately 2 weeks before the first day of class. Permits ordered after the first day of classes will be mailed within 2 business days. 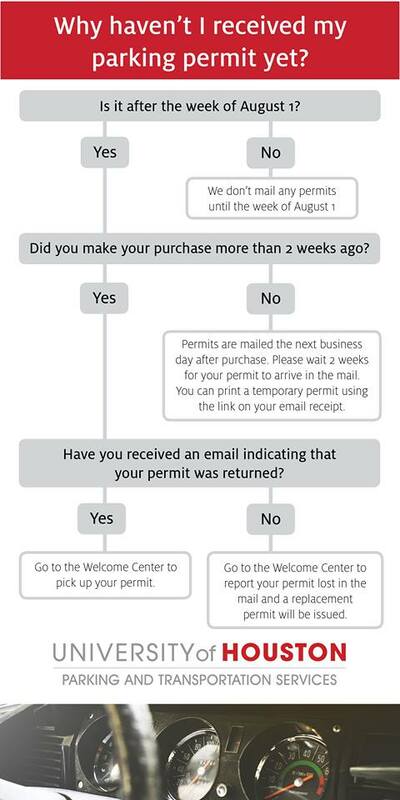 A temporary printable permit is assigned by the system and can be used for up to 7 days while you wait for the permanent permit. The link for this temporary permit is provided in the confirmation email you received once you complete your purchase. This chart helps illustrate the mailing process/timeline. 3. It was determined that my permit was lost in the mail or was returned to your office by the post office. Will you re-mail my new one? No. We ask that you come to our Parking Services desk at the Welcome Center garage to receive a replacement in order to minimize the risk of losing another permit in the mail. 4. What happens if I lose my permit? No problem! Lost or stolen permits may be replaced at the cost of $50.00 in our office. If your permit was stolen and you have a police report filed, you may bring a copy of that report and we will issue a replacement free of charge. Only 1 permit per academic year will be replaced at $50. Any additional replacements will be at full price. 6. I’m not satisfied with the permit that I selected. May I change it? Individuals will have the opportunity to exchange their permits, only BEFORE the desired permit sells out. For example, if you currently have a Student permit and would like to exchange it for a Remote Campus permit, you will only be able to if Remote Campus permits are still available for sale. If the permit you desire is sold out, you will have the option to sign up on a waiting list, as a limited number of permits MAY become available at the start of the SPRING and SUMMER semesters. If you receive an email offering you a permit while on the waitlist, you'll have one week to claim it before it's offered to the next person on the list. 7. Do I need to register my vehicle with the Parking and Transportation office? Yes. License plate information is used by PTS and UH Police to better serve you. PTS uses it to contact you if you are issued a citation as requested by SGA legislation. UH Police uses the information to contact you in case that your vehicle needs to be moved or is in an accident. Having your vehicle’s license plate registered with the parking office will not prevent you from receiving a citation if your permit is not properly displayed or if you are parked incorrectly. You can register your vehicle through your myParking Account. 8. What forms of payment do you accept when I purchase my permit? During the registration process, you can choose to place the charges on your student account (Fee Bill) or pay with a credit card (Visa/MasterCard/Discover Card). If you choose to add the fee to your student account, you can pay the charges using MyUH (PeopleSoft) or in person at the Cashier's counter at the Welcome Center. Please note that it will take a few days for the permit fee to be posted your Fee Bill. For payment options, please visit the Student Financial Services website. 9. What is the difference between the student parking permits? A a detailed description of each permit type can be found on the Which Permit Type is Right For You? page. 10. If I live on campus where can I park my car? You may choose to purchase a student, garage or remote campus permit and park in that designated area. A limited number of residential parking permits are available for students who live in the University Lofts. These permits are only valid in reserved lot 21A from 7 a.m. - 4 p.m., and all other student lots on campus after 4 p.m.
11. I received a citation, but I want to appeal it. What do I do? You may appeal a citation online through your myParking Account, accessbile via AccessUH. Your appeal will then be reviewed by a traffic court made up of students, faculty and staff. Once they have issued a decision you will be notified of next steps. The court may choose to dismiss the citation, uphold it but reduce the fine, or uphold the ticket as written. You can submit pictures online with your appeal as evidence. 2. How do I pay for a permit? During the registration process, you can choose to pay with a credit card (Visa/MasterCard/Discover Card) or have the cost of your permit deducted from your monthly or bi-weekly payroll. Please note that in order to be eligible for payroll deductions you must be a regular full or part-time employee that is paid by the university. 3. Who is eligible for a staff parking permit? All regularly employed and benefits-eligible full and part-time staff members are able to purchase a parking permit. Campus partners may also obtain staff parking permits by coming into the parking office and requesting one. 4. May I use my permit in more than one vehicle? You may transfer your permit between vehicles as long as it is displayed properly and only one of those vehicles is on campus at a time. 5. Where does my Faculty/Staff permit allow me to park? Detailed information about where each permit type can park can be found on the Which Permit Type is Right For You? page . You may also reference the Campus Parking Map for parking locations. 6. I am transferring to another building. Can I switch lots? Yes. If you have an Ungated permit there is nothing special that you need to do as you already have the permission to use any Ungated lot on campus. However, if you have a gated permit and wish to change lots, go to Parking Self Service in AccessUH and sign up on the waitlist for the lot you’re interested in. 7. I am having trouble with my gate card. What should I do? Please call L'Oreal O'Reilly-Smith at 832-842-5753. 8. Too much was deducted from my paycheck for my parking permit. What should I do? 9. I am leaving the university. Can my spouse take over the permit payments? No. If you have a permit and have terminated your employment you must return your parking permit to the parking office in order to clear that item off of your termination checklist. 10. I received a citation, but I want to appeal it. What do I do?